One of the focal points in our neighborhood are the Twin Lakes with their lovely lighted fountains that border Campbell Road. These beautiful lakes were originally cow ponds. 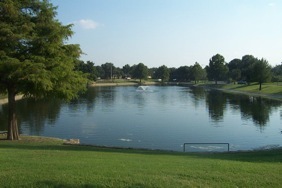 The lakes were donated to the City of Dallas by the Highlands North developers to be used for storm water retention. Later spillways and pipes were added. In 2003 the lakes were dredged and stonework was installed to prevent erosion at a cost to the city of $450,000. 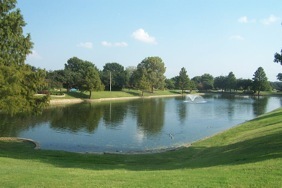 Dallas Parks Department provides the maintenance and irrigation for Twin Lakes and a portion of HNHA dues are used to purchase and maintain the fountains, electricity, sign flower beds, USA and Texas Flags and other amenities. Highlands North has a wonderful amenity in the Preston Ridge Trail. A terrific neighborhood treasure for walkers, bikers, runners, skaters and others who want to stay active and be outdoors. In conjunction with the City of Dallas, the Friends of Preston Trail, Inc. facilitated its development and beautification over a ten year period involving hundreds of volunteers from this and adjacent neighborhoods. Between the City's paving and bench cost and the value of the volunteers' efforts, this created a million dollar amenity for our residents and connects with other Dallas trails all the way to White Rock Lake and the Katy Trail. For more information, please go to the Friends of Preston Ridge Trail website. Salado Park is a 4.2 acre neighborhood park that was established in 1974. It has benches and trails that connect to the Preston Ridge Trail. It features an abundance of seasonal wildflowers for the neighborhood to enjoy. In 2005 HNHA entered a cost sharing agreement with the City of Richardson to plant landscape between the stucco fence and Coit Road, including a covered DART station. This beautified the east entrance to our neighborhood. HNHA share of the project was $19,000. The ongoing obligation includes Richardson Parks maintains the area and HNHA dues pay the water bill.